Cruise Ship Shore Excursion - A Victoria City Tour like no other! Discover Victoria’s rich history and scenic beauty on a tour of this charming Provincial Capital. Driving through the stately downtown core you will see Government Street, the Legislative Buildings, Canada's oldest Chinatown and the last remnants of Fort Victoria. Your City Tour continues as you follow Antique Row before passing Craigdarroch Castle. The Mt. Tolmie lookout high above the city offers breathtaking views of downtown Victoria and the surrounding countryside. This tour takes in the scenic Marine Drive along Oak Bay and the Victoria waterfront and you will also tour through Beacon Hill Park - the largest park of its kind in the City. The best highlights include Chinatown, Oak Bay, Marine Drive, Beacon Hill Park and an exclusive stop atop the Mt. Tolmie viewpoint. As part of this tour we include admission to the Craigdarroch Castle National Historic Site. Explore one of Victoria's sightseeing jewels! 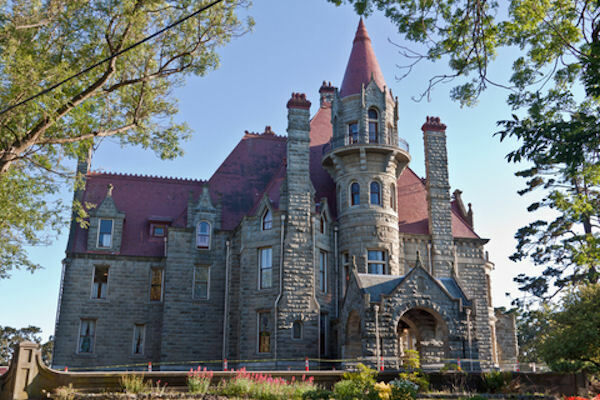 Craigdarroch Castle is one of Victoria's must-see attractions. Craigdarroch was built between 1887-1890 for Robert Dunsmuir, a Scottish immigrant who made his fortune from Vancouver Island coal. This legendary Victorian mansion, built on a hill overlooking the City of Victoria announced to the world that Robert Dunsmuir was the richest and most important man in Western Canada. He died in 1889 leaving his entire estate to his wife Joan who lived in the Castle until her death in 1908. The immense fortune of the Dunsmuir family is reflected in the four floors of exquisite stained glass windows, intricate woodwork and fabulous Victorian era Furnishings. Once you’ve entered the circular room at the main entrance, your self-guided tour begins. You will be treated to 39 rooms, most of which are furnished lavishly in the 1890s-1900s period, so enjoy the ambiance as you climb the 87 stairs to the tower. There you’ll see fabulous views of Victoria, the Strait of Juan de Fuca, and the Olympic Mountains. Please note: Tour only available May 2 through September 30, 2015.